Raglan-long sleeve, knee length night shirt. Classic comfort. ..
Sleeveless crossover neckline mid-calf length gown. Oh so comfy! 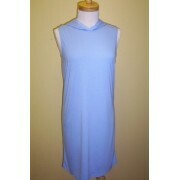 ..
Sleeveless crossover neckline dress just above the knee. Great for relaxing summer nights! Bamboo..
Sleeveless, knee length hooded caftan. Stylish and cool, all in one. ..
100% HCW jersey slip with spaghetti straps. ..
3/4 sleeve, slightly gathered, to the knee. Stylish enough for outside wear! Bamboo/Cotton Fabric.. Detailed around the neckline with side slits. Perfect withHCW's tights. ..